The French Ministry of Agriculture has called for agro-ecological transitions that reconcile farming and the environment. 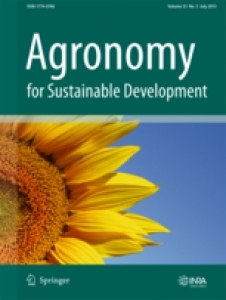 In this review, we examine the transformations of farmers and AKIS (Agriculture Knowledge Innovation System) actors’ work during agro-ecological transitions, and argue that the content, organization, and aim of farmers’ work are influenced by agricultural training, agricultural development, and discussions between peers, research, and regulations. Our main findings concern those transformations. The first finding was that there is an increasing expression of local particularities (situated ecological processes, micro-climates, etc.) and farmers’ singularities (e.g., relationship with nature). These particularities challenge AKIS players’ forms of organization and intervention, which used to be built on generic knowledge. Our second finding was that AKIS players have to consider their action as one potential contribution to the development of farmers’ experience: Their interventions become part of the flow of the farmer’s activities. The question for AKIS players is then: How can farmers’ own discovery of their natural and technical environment from new perspectives be facilitated? Thirdly, we found that transformations of work are systemic: The “doing”, the knowledge applied, and the values and norms to which subjects refer change. Facilitating transition can no longer be considered as a problem of knowledge availability. Fourthly, production of agronomic knowledge and ways in which it is disseminated are being challenged. Not only does knowledge have to be certified by scientific norms and methods, it has also to be valued by actors if it is to have an impact. The prescriptive relationship of science and AKIS players towards farmers is likewise challenged. This review raises many questions: Do agro-ecological transitions contribute to reorienting the development of farmers’ activity? Are agro-ecological transitions conducive to the development of sustainable farm work? What transformations of AKIS players’ work are needed to better support agro-ecological transitions? Article selected from proceedings of the 1st International Symposium on Work in Agriculture, which was held in November 2016 at the State University of Maringá (UEM), Brazil.